The British occupied New York City in August 1776, and the city would remain a British stronghold for the duration of the Revolutionary War. 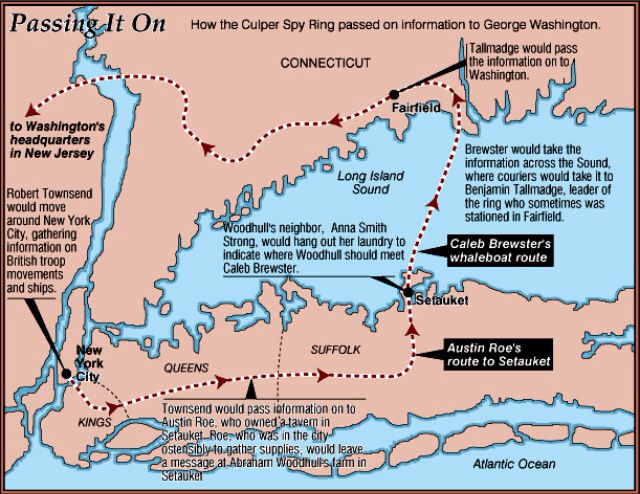 The Culper Ring, also known as the Setauket Spy Ring, was a group of operatives whose purpose was General George Washington aware of the movements of the British in New York City and Long Island. Some credit Nathan Hale’s capture and execution with having launched the Culper Spy Ring. Nathan Hale, a young Patriot, volunteered for an intelligence-gathering mission to the city, but the British captured Hale carrying drawings of their fortifications in his shoe and hanged him on September 22, 1776. He is best remembered for his last words: “I only regret that I have but one life to give for my country.” Hale’s death illustrated the grave dangers inherent in spying for the Patriots. In summer 1778 General Washington asked 24-year-old Major Benjamin Tallmadge from Setauket, Long Island, to recruit people who could be trusted to collect good information in New York City. Tallmadge had been Nathan Hale’s college roommate at Yale. Perhaps with Hale in mind, Washington made sure that the Culper spies had more support. Tallmadge established an elaborate system of riders and couriers who used aliases, a coded dictionary and invisible ink to pass on messages. Everyone except Robert Townsend were born and raised in Setauket. The name of their spy ring was derived from the aliases taken by two of its main members: Samuel Culper Sr. (Abraham Woodhull) and Samuel Culper Jr. (Robert Townsend). They operated mostly in New York City, Long Island and Connecticut, and conducted covert operations until after the end of the Revolutionary War, but its heyday was between 1778 and 1781. Robert Townsend, a merchant in New York City, agreed to supply much of the information. He was a Patriot pretending to be a Loyalist (British supporter), and his acquantances believed he wanted the British to win the war. Townsend also wrote for a loyalist newspaper, so people freely gave him information, including British officers, which he passed along to Austin Roe. Austin Roe, a 29-year-old Setauket tavern owner, rode the 110-mile round trip to New York City every week to order supplies for his tavern, which was an excellent cover. The road was heavily traveled by British and Tory troops and by highwaymen. He made many of these trips and was never discovered. While there he retrieved secret messages from Townsend, usually in a bundle of notepaper, which he carried back to Setauket and hid in a drop box for Abraham Woodhull. Abraham Woodhull, age 27, was considered the leader of the Long Island spies, and he ran the group’s day-to-day operations on Long Island. He also decided which information needed to be moved along the spy ring, and which would ultimately be forwarded Tallmadge in Connecticut, then on to General Washington. Woodhull lived in constant anxiety of being discovered. Anna Smith Strong was born on April 14, 1740. She married Selah Strong III in 1760, and they had nine children. The other Culper Spy Ring members were her friends and neighbors. 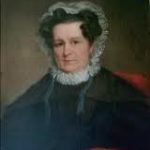 Her husband was a leading Patriot judge, and their family controlled one of Long Island’s manors: ancestral estates much like those in England. Anna’s home on Strong’s Neck in Setauket and her husband’s political position made her family a target of the occupying British soldiers. 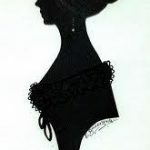 In 1778 her husband Judge Selah Strong was arrested and confined on the British prison ship Jersey in New York harbor for “surreptitious correspondence with the enemy.” The conditions on those ships were terrible, and she finally got permission to bring him food, which evidently saved his life. 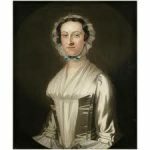 Anna’s wealthy Tory relatives (British supporters) helped her bribe British officials to parole her husband to Connecticut, where he stayed for the remainder of the war, taking their children with him. Therefore, Anna was alone on Strong’s Neck throughout the rest of the war. She stayed behind to take care of the family home because empty homes were subject to greater destruction and abuse. Many women did this during the Revolution because they were seen as non-combatants. Woodhull needed his neighbor Anna Smith Strong to advise him of Caleb Brewster’s location. Caleb Brewster came periodically across the Devil’s Belt (Long Island Sound) to deliver or retrieve the Spy Ring’s messages. Brewster, one of the most daring of the group, was also the only member whom the British had definitely identified as a spy. Brewster and his crew rowed his whaleboat across the Long Island Sound to and from Connecticut. They were in constant danger because there were British frigates constantly patrolling the Sound, so he hid his boat in the willows of the bay. Anna Smith Strong’s assignment in the Culper Ring was to signal Brewster’s arrival to Abraham Woodhull. She did this by hanging laundry on her clothesline in pre-arranged configurations, a system that fooled all by the wisdom of its simplicity. If she hung up a black petticoat, it meant that Brewster was in town. By counting the number of white handkerchiefs scattered through her wash, Woodhull knew in which of six coves Brewster hid his boat. Under cover of darkness, Woodhull then rendezvoused with Brewster and passed along the secret messages. Brewster and his men then crossed Long Island Sound to Connecticut and passed the information to Tallmadge who passed it on to Washington’s headquarters in Westchester County, New York. Strong is not referred to in the dispatches, although there are several references to her property and the British movements around her home. Later, when British officers occupied the Manor House, she lived in a small cottage across the Bay from Woodhull’s farm to keep an eye on the farm and main house. The house is no longer standing, but around 1845 a new house was built on the same site as the family home that the British occupied during the war. In 1779 the British decided to capture the American fort at West Point, New York. The Great Hudson River Chain across the river from Constitution Island to the shore near West Point prevented British ships from sailing upriver and dividing the Colonies. The only way to get past was for someone to unlock the chain. The key was kept by the commanding officer at West Point, General Benedict Arnold. Arnold committed his infamous act of treason and devised a plot to surrender West Point to the British for 20,000 pounds. The plan was discovered by the Culper Ring. The information was relayed to General Washington, but Arnold escaped and fled down the Hudson River to the British in New York City. Although the members of the Setauket Spy Ring took part in many risky endeavors throughout the Revolutionary War, none were ever caught. Among the techniques the spy ring used to relay messages included coded messages published in newspapers and using invisible ink to write between the lines of what appeared to be a typical letter. Secrecy was so strict that Washington himself did not know the identity of all the operatives, and the general public was not aware of the spy ring’s existence. Despite some strained relations within the group and constant pressure from Washington to send more information, the Culper Spy Ring achieved more than any other American or British intelligence network during the war. The information collected and passed on by the ring from 1778 to war’s end in 1783 concerned key British troop movements, fortifications and plans in New York and the surrounding region. After the war, Selah and Anna were reunited, and they had another child named George Washington Strong. Their home survived the war safely, and the Strong Family remained there. Anna died August 12, 1812, and Selah Strong in 1815. They are buried in the Smith-Strong family graveyard along Cemetery Road on Strong’s Neck. 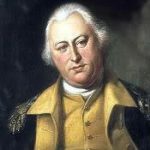 It was very appropriate that he [Selah Strong] should entertain the General [Washington] at Roe’s, as the house was the former residence of his grandfather, the first Strong to bear the name of Selah., who came to Setauket about 1700 and on March 23, 1703, bought the land from Thomas Clark and built the house. Strong had no idea at the time that his grandparents, Selah and Anna Smith Strong, had been a vital part of the Setauket Spy Ring. It is most likely that President Washington stopped at the Roe Tavern to acknowledge and thank the people of Setauket who risked their lives to aid the patriot cause during the American Revolution: Selah and Anna Smith Strong, Abraham Woodhull, Austin Roe and Caleb Brewster. The identity Robert Townsend (Culper Jr.) was discovered in 1939, when a trunk of old letters was discovered in the Townsend family home. Historian Morton Pennypacker noticed the resemblance in the handwriting in these letters and letters written by Robert Townsend in George Washington’s letter collection. Pennypacker then discovered the identity of the other spies in Setauket and New York City and published his findings in a book, General Washington’s Spies on Long Island and in New York, in 1939.